Location: Clevedon, North Somerset, England. 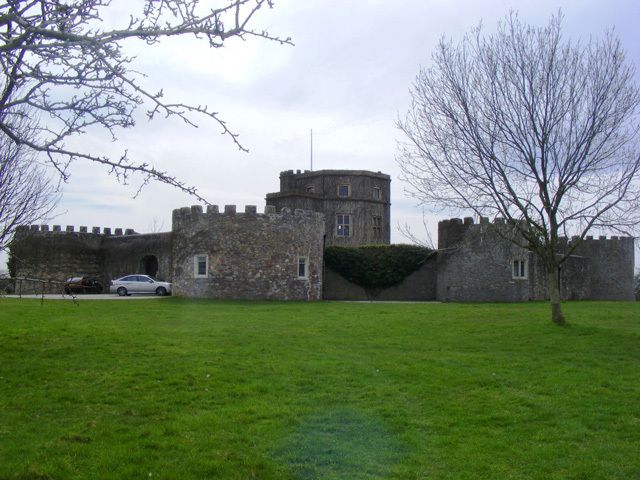 Notes: Walton Castle is a 17th Century, Grade II listed castle set upon a hill in Clevedon, North Somerset, England, on the site of an earlier Iron Age hill fort. The Domesday Book records the site as belonging to "Gunni The Dane", however the structure that occupies the site was built sometime between 1615 and 1620 by John Poulett, 1st Baron Poulett. The castle was designed as a hunting lodge for Lord Poulett, a Somerset MP. The English Civil War saw the decline of Poulett's fortunes, and by 1791 the castle was derelict and being used as a dairy by a local farmer. In the early 19th century, the manor of Walton in Gordano, including Walton Castle was bought by Philip John Miles who also held properties and extensive estates elsewhere including Kings Weston House, Leigh Court, Cardigan Priory and Underdown in Ledbury, Herefordshire, whence his family had originally come. The castle passed through the Miles family by descent and in 1975, the castle's owner, Sir William Miles, the 6th Baronet, offered to give the ruin to the public if some money could be found to preserve it. The estimate for this rose from 6,000 to 46,000 and the plan fell through, as did a plan to set up a trust.